GNDU research fellow recruitment 2016-17 notification apply : Guru Nanak Dev University (GNDU) invites application for the position of junior Research Fellow in DST sponsored Project entitled “1-Arylbenzimidazolium based molecular architect for recognition of anions” under the supervision of Professor Subodh kumar, Principal investigator (PI). Candidates who completed their M.Sc is a good opportunity.The individuals who are the occupation seekers searching for govt employments in Punjab this is the best chance to apply. Competitors read the official notification then read all the guidelines and miners precisely then apply before the last date online application got. All the interested and eligible candidates can appear walk – in – interview on 4th July 2016. Educational Qualification for the Job: M.Sc. Candidates Age Limit: The age of the candidate will be according to rules and regulation of Guru Nanak Dev university organization norms. Academic qualification details: Candidates must possess master degree of science in Chemistry (M.Sc.) with at least 55% marks. Applicant should be NET / GATE qualified. Process of selection for the job: The selection of the candidates will be on the basis of walk – in – interview that will be held at Guru Nanak Dev University (GNDU), Amritsar Punjab on 4th July 2016 at 12.00 p.m. Process of applying for the job: Candidates should submit the application along with attested copies of certificates. The original certificates will also be required at the time of interview that will be held at Guru Nanak Dev University (GNDU), Amritsar Punjab on 4th July 2016 at 12.00 p.m. 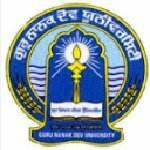 Address of interview held: Interested and eligible applicants applying for the position of junior research fellow may attend walk – in – interview that will be held at Guru Nanak Dev University (GNDU), Amritsar Punjab on 4th July 2016 at 12.00 p.m. Important Dates: Interested and eligible applicants can appear walk – in – interview on 4th July 2016. Note : Here we are giving purpose of interest that are gather from online web look for. so who are the Job seekers looking for Jobs they can simply check the official webpage about the cost, online application, informational capacity, last date.Jobswalker.com is not responsible for any future changes.